SugarCRM is hoping to gain inroads against its much larger rival Salesforce.com with a revamped user interface it says places emphasis on the needs of individual users, not business managers seeking a wide view of sales activity in their company. This "user-first" design approach includes a few pages from Salesforce.com's playbook, however, such as collaborative activity streams that seem close in purpose to Salesforce.com's Chatter, which was announced in November 2009. 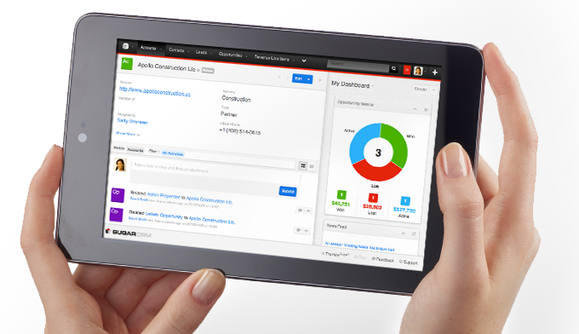 SugarCRM is also building in what it calls "contextual intelligence" about objects in the CRM system. For example, if a user is examining a particular company's customer record, the system might pull in a news article about a recent acquisition the customer made. It will be possible for SugarCRM users to integrate data from internal ERP systems, social networks and information services such as Dun & Bradstreet. From a pure productivity standpoint, the new SugarCRM features inline editing, "streamlined visual forecasting" and a common experience for desktop and mobile devices. "I think we measure up better or well than anybody in the industry when it comes to extensibility of platform." CRM software in general has long been knocked for a lack of user adoption; busy salespeople simply haven't wanted to spend time continuously entering information to keep their manager up to date. With the revamp, SugarCRM is attempting to make its software something people want to use because it helps them do their job better, said Martin Schneider, head of product evangelism. Also, SugarCRM is making a special effort to emphasize the different pricing tiers it offers customers, as well as contrast those tiers with what Salesforce.com charges customers. SugarCRM editions start at $35 per user month for the Professional edition, which is limited by the omission of features such as custom module activity streams and product-level forecasting. But SugarCRM Enterprise Edition, at $60 per user per month, provides many more SugarCRM features but for an assigned technical account manager companies will have to fork over $150 per user per month for Ultimate edition. In contrast, Salesforce.com Professional Edition is $65 per user per month and Enterprise Edition, its most popular version, is $125 per user per month. However, such comparisons only invite debate over whether SugarCRM customers get equivalent functionality to Salesforce.com at that lower price. SugarCRM and Salesforce.com are "pretty well aligned now," Schneider claimed. Where SugarCRM has an edge is in the extensibility of its underlying platform, compared to Salesforce.com's own Force.com, he added. "I think we measure up better or well than anybody in the industry when it comes to extensibility of platform." SugarCRM is also continuing to emphasis the fact that customers can run its software on-premises or in the cloud, while Salesforce.com offers only cloud deployments in its own data center. While Salesforce.com is the cloud computing industry's juggernaut, privately held SugarCRM is starting to see additional momentum lately. It now has 7,000 customers, and was profitable in its third quarter, said CEO Larry Augustin. SugarCRM recently accepted about $40 million in venture funding from Goldman Sachs. That money "leaves us in a very, very strong place from a balance sheet perspective," Augustin said. While SugarCRM has long been expected to file for an IPO, Augustin declined to comment on the timing of such a move, although he confirmed that the ultimate goal is to go public. SugarCRM also seems to be downplaying the fact it is built on open-source software. "We don't lead with open source in a sale," Augustin said. In general, SugarCRM focuses its own engineering efforts "on end-user functionality at the application level," Augustin said. "The place where we get contributions is testing, porting, integrations, all of those things." Its first Twitter integration, for example, came from a community contribution. If and when a community feature becomes a must-have for the commercial version of SugarCRM, the company starts supporting it commercially, Augustin said.